Picnic and Family Time at Don Limone in Tagaytay. Always a Good Idea! Is it just me and my hormones or is it becoming unbearably hot in Manila? Any idea of bringing down your body temperature is always a welcome one. Taking in a refreshing drink or submerging yourself in your swimming pool or bathtub, usually does the trick but only momentarily. You want something that will give you more than instant gratification. For people residing in the south of the metro, Tagaytay is always a good idea. Less than an hour’s drive away from Alabang, the cooler breezes and the mountain scenery make you forget that it was promising to be a scorchingly-hot-killer-day in Metro Manila. Temperatures have been consistently going up, up and away lately and it’s not even funny. So, when someone suggests, “Tagaytay! Lets go!” It’s definitely a no-brainer. Forget about those pressing weekend errands and any pre-arranged schedules. You’ll find a way to get around them later on. You pack your stuff and think PICNIC! Or a hassle free alternative, which is, go to a nice restaurant and enjoy some cool ambience and great food! It is serendipitous then, that someone recently mentioned to me about a newly opened Mediterranean restaurant in Tagaytay called Don Limone. 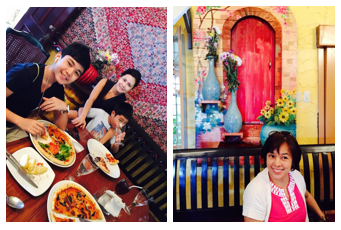 I’ve heard many good things about Don Limone in BF Homes Paranaque. Apparently, they have earned a reputation for their cheesecakes, which I’ve had the privilege to try when a cousin brought some to a potluck event once. So, on the merits of the memory of the luscious cheesecake alone, we decide to try it out for lunch. Don Limone is not hard to find. It is just past Skyranch and Mushroom Burger and near the police station on the road that leads to the Mahogany market. Arriving at the restaurant, you immediately get that out of town feel you were hoping for. Trees and shrubs and flowers welcome guests at the entrance gate and line up the quaint dirt road leading to the restaurant. The vibrant colors of the Mediterranean and the festive feel of the place instantly wake you up, like a shot of espresso, from the short but sleepy drive. After taking in the scenery with a few snapshots and selfies, our hunger took over in anticipation for what was to come. The food definitely did not disappoint! My hungry family feasted on a sampler of appetizers like Hummus en Fuego, Feta Caponata and Muhammara Parmegiana, Greek salad, pasta, pizza and platters of chicken espetada, a Portuguese style of presentation of meats hanging on a stick and Lamb piccata, which was my fave! Everything was delicious. Of course, as a sweet ending to our delightful gustatory experience, our most awaited cheesecake; Amaretto and Chocolate supreme was served with candied fruits and edible flowers. Such a treat for all our senses! 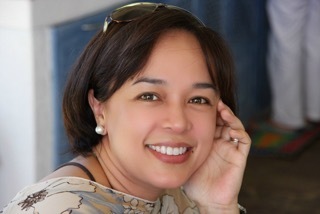 Chef Betty Sacilioc told us that she grows most of the herbs, vegetables and flowers used in their dishes. The rest come from nearby local farmers. Meats are imported from Australia and New Zealand. This is good to know. Only the best ingredients at Don Limone! We will surely be back! This time with a larger appetite! With full stomachs and ready for our siesta, we head out to our little slice of Tagaytay Paradise. A private house on the ridge with spectacular grounds and the most amazing view of Taal Lake and Volcano which belongs to the family of one of sis Janelle’s best friends. They have been kind enough to share their awesome home with our family for as far back as I can remember. True to the summer, the heat is much more than the typical Tagaytay cool climate, but we refuse to stay indoors on such a nice day. We choose to lie down on our spread blankets on the grass and just stare out at the majestic view, which seems to have been custom-made for the house. So while the kids get busy with their games and chirpy chit chattering, the adults start singing and dancing to their music and preparing for another food fest. Out comes all our baon. The wines, the cheeses, prosciutto and the very in demand caviar pie of sis Janelle, pre–prepared and assembled on the spot by her good friend, Monica. The grill gets sizzling with the barbecue and soon enough, we find ourselves eating again! What a wonderful way to spend an otherwise ordinary Saturday with family and dear friends. Janelle very kindly offered her Caviar pie recipe to share with all my readers. Believe me, you will want to try this. Chop eggs while still hot and mix in butter and half of the chopped onions. Press onto the bottom of an 8-9”pie plate. Cover in plastic wrap and chill for at least 30 minutes. Chop anchovies and mix in mayonnaise and parsley. Spread evenly on top of chilled egg layer. Transfer caviar to a small bowl and add the remaining chopped onions and the lemon juice. Spoon on top of anchovy layer. Ehen ready to serve, top the pie with sour cream. Serve with Melba toasts. Next articleYour No-Fail, No-Brainer Pasalubong: BongBong’s Piyaya and More!